Hello dears! I'm still a bit jetlagged but yesterday I managed to at least get my bags unpacked and laundry sorted. Work has been hectic too, we started the new schedule and the staff is adjusting to the change. Thankfully the grandparents are here to watch LO - I'm not sure what I'll do with work once they're gone in a month, but hopefully things will work out! Meanwhile, LO is having a tough time adjusting to the change in times. She's been knocking out cold early or fussing and staying up late. Hopefully she'll get back on schedule soon! Last week I mentioned that Zoya Rica looked similar to Tinsley, and tonight I have some swatches of Tinsley followed with a comparison of the two. 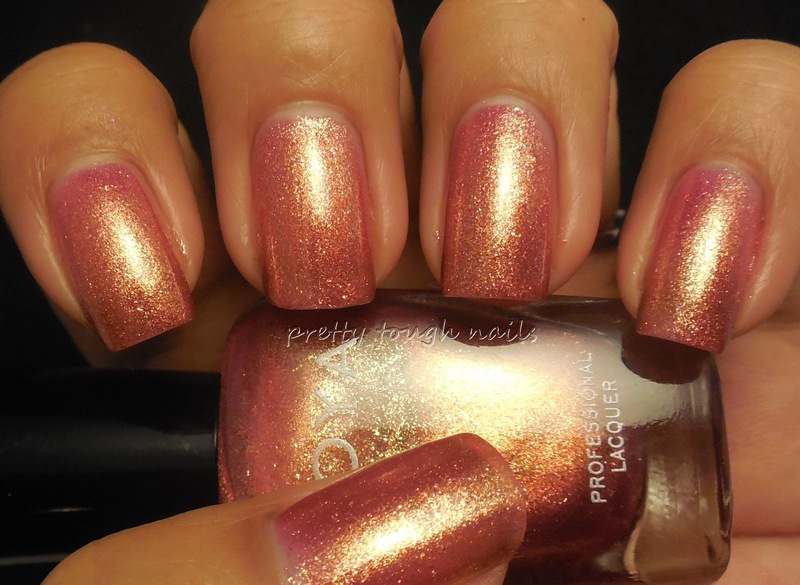 Tinsley is part of Zoya's 2013 summer 2013 Irresistible collection, and is a rose foil with gold flakes. I really thought I was going to like this polish when I ordered it, but after wearing it I think it washes out my skin tone a little bit. I used two easy coats and had no trouble with application or formula. This is with no topcoat. The color is gorgeous - I love a nice warm rose that is accented with gold. It reminds me of a pink rose with sunshine filtering through its petals. The color didn't do anything for me unfortunately, so I think it's going to the swap pile. Rica has a very similar finish as Tinsley except instead of rose, the color is coral with gold flakes. Here you can see them side by side. Tinsley is a touch warmer than Rica, and Rica a cool leaning neutral IMO. Can you see the difference in shades? I'm convinced that cool colors look better on me than warm colors, but maybe I'm just color blind. Of the two, which do you prefer? you just stumped me lmfao! THANKS ALOT! IDK which one to get now hahaha I am leaning more on Tinsley when before I was leaning on Rica.